Like the crow, we wondered about our purpose. Why are we working so hard? How can we contribute to our community? How can we share our enjoyment and the bounty of this beautiful, pure, Lake Superior place? Like the crow, we have wandered. As we've wandered, we've made connections with our neighbors. As we've connected, we've learned to enjoy what is closest to us. We live in a special place...a place that is unique, natural, fresh, and inviting. Like the crow, we've found our purpose. Our purpose and our appreciation of this place is wrapped into Copper Crow Distillery. We've taken our skill in business, our knowledge of science, the availability of the products this Lake Superior region has to offer, and we've carefully crafted them into unique spirits. Our grains are regionally sourced, whenever possible. Local orchards and farmers supply us with seasonal products. Our spirits are cut to proof using fresh, pure, well-water from our Lake Superior aquifer. When you visit Copper Crow Distillery, you will feel you are somewhere special. Our strong, impressive building, nestled in the pines will meet you at the end of our driveway. The comfortable, relaxing interior of our tasting room will draw you in. Slide onto a stool at the bar, or grab a seat at a table. You're sure to be tempted by a cocktail (or two) from our seasonal menu. Tours and tastings are offered, and encouraged! We want you to enjoy your time with us. Let us help you enjoy The Spirit of the Superior at Copper Crow Distillery. A happy Golden Retriever and aspiring Wally-World greeter. Jackson is the official dog of the Copper Crow Distillery. No matter the season, Jackson enjoys walks in the park and spending time at the beach. His main goal in life is to rumble a friendly "hello" to everyone he meets, and to find his next meal. Curt is an outdoorsman who grew up hunting and fishing in the Red Cliff -- Bayfield area. 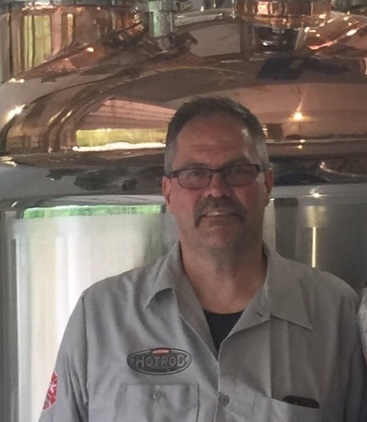 His respect and knowledge of the outdoors, his success as a businessman, and his love of whiskey has led him to owning and operating Copper Crow Distillery. His main goal in life is to make the best damn whiskey around! Linda and Curt have been together since high school. Members of the Red Cliff Band of Lake Superior Chippewa, the Basina's have made their home in Red Cliff. Their love of "road tripping" led them to visiting distilleries and wineries along the way, and the vision for Copper Crow Distillery was born. Linda and Curt enjoy working side-by-side, spending free-time with their family and dogs, and sharing time with friends. Their main goal in life as a couple is to keep being a couple.